The new Mac App Store is here | It-11 Audio / Tonegeek"
Announced a few months ago, the Mac App Store is online, today. You will find more than 1000 applications free … or “have to pay for”. This new store will install when you upgrade your Mac to Snow Leopard Mac OS X 10.6.6. 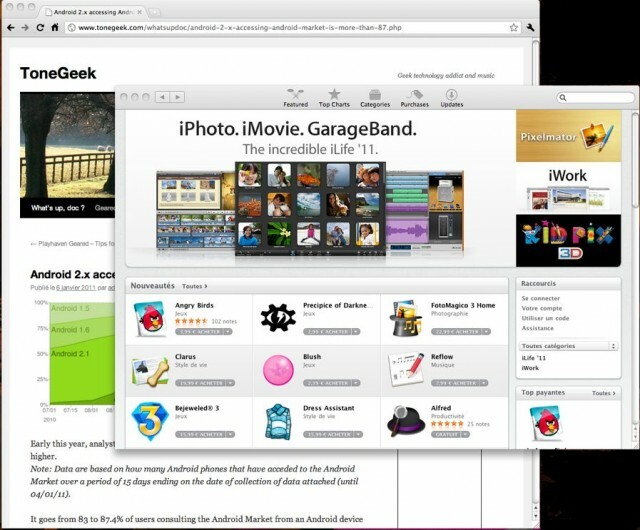 What are the advantages of using the Mac App Store? The application installation and updates are done in one click + if you change your Mac for a new one, all applications will be reinstalled automatically. This version 1.0 comes with a small bug. You may receive an error message when you connect for the first time to the App Store. This bug is simple to solve. Restart iTunes and the Mac App Store. The form of the conditions of use will appear the next time you launch Mac App Store. Once you have accepted the conditions, you will be able to buy and download applications. This entry was posted in What's up, doc ? and tagged apple, leopard, mac, mac app store. Bookmark the permalink.